I pushed an update for Top 10 a few days ago which brings you some cool new features including the ability to edit counts, set thumbnails and improved shortcode options. 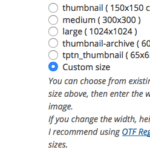 Following along the lines of Contextual Related Posts, Top 10 v1.9.10 brings a new meta box on your Edit Post / Page or Custom post type screen that allows you to set the custom thumbnail as well as edit the post count for the post. The meta box will use the same meta field as specified in the General Settings. If you’re using the default field name i.e. 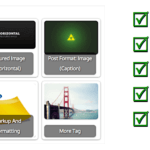 post-image and you’re using my other plugins Contextual Related Posts and Where did they go from here, then they will automatically recognise this thumbnail! Another major change in the plugin is the use of the shortcode. 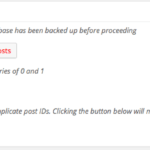 You’re no longer restricted to three parameters as earlier, but all the options that can be passed to tptn_pop_posts(), which is all the settings that you can configure in the Settings page. Check out the function tptn_default_options if you’re curious for what is configurable. The latest version of the plugin also brings the ability to turn off tracking for Editors. This is especially useful if you have a multi-user blog and Editors routinely edit posts and visit these posts. 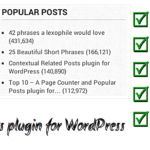 As usual you can upgrade the plugin from within your WordPress admin. If you’re using Top 10, do consider giving it a 5-star review! If you got questions, please use the forum. Emails and comments are not the best way to get support unless you’re willing to hire me to solve your problem related to Top 10! 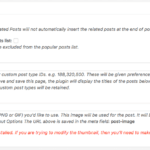 Modified: Shortcode now accepts all the parameters that tptn_pop_posts() can take. For a full list of parameters, please check out the FAQ.